A world first, each colour bloom has its own scent. Giant rose-like flower heads measuring 4-5in. Collection of peach and apricot pastel shades. 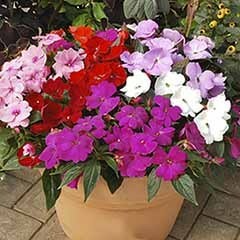 Perfect for pots or beautiful indoor displays. 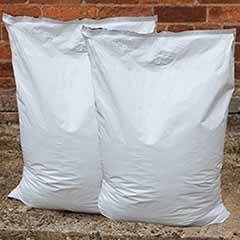 Supplied as 12 plug plants ready to plant between April and June for optimum performance. World First! 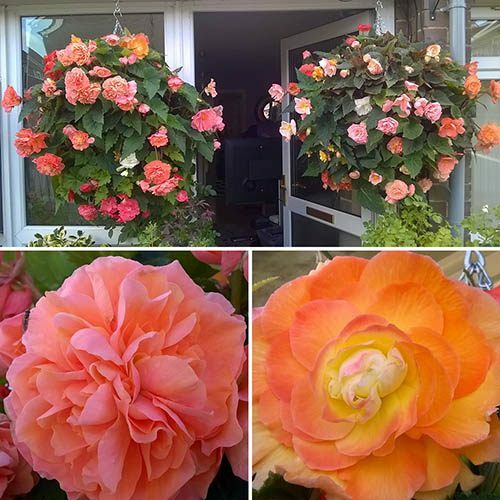 At last, truly fragrant Begonias - a summer long display of gorgeous large blooms, each colour a different scent!! Its true! These really are the very first truly fragrant trailing Begonias! Flower power and gorgeous soft scent all wrapped in one sensational flower. 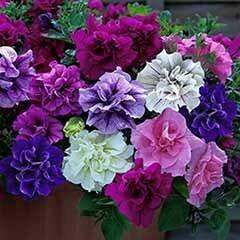 These gorgeous plants are admired both for their delightful fragrance as well as their giant rose-like blooms. Their aromatic scent literally fills the air with a delicious medley of fragrances ranging from fresh citrus lemon to indulgent soft rose. Each amazing flower head measures up to 4-5' across - so large in fact that they will hang down in a beautiful waterfall cascade of soft pink, peach pastels and apricot shades. 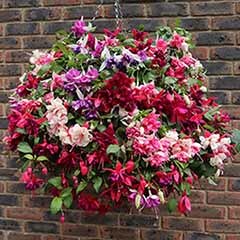 Plant them in hanging baskets, tubs and planters where they can tumble down over the side, they thrive in hot and dry, or wet and windy Summers - one of the main reasons behind their success. 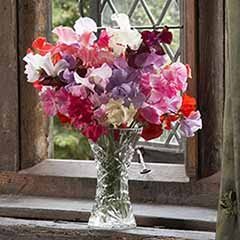 A small posy of them also makes a lovely indoor display as does floating a few heads in a large bowl. Of course both will smell simply fantastic! Be one of the first to share in this remarkable breeding achievement, our Customers have been snapping these up for the last 2 years we have had them available, and it's easy to see why! 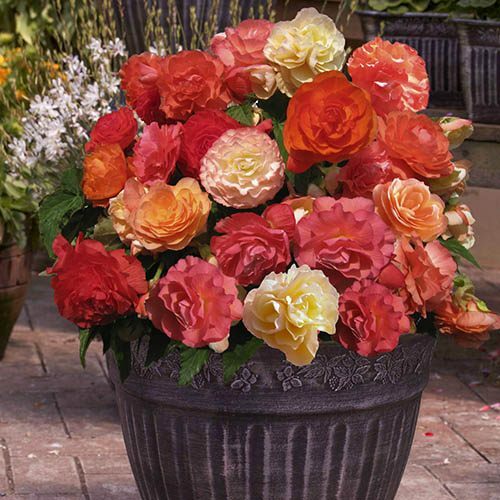 Get all 'Aromantic' with these Fragrant Begonias. 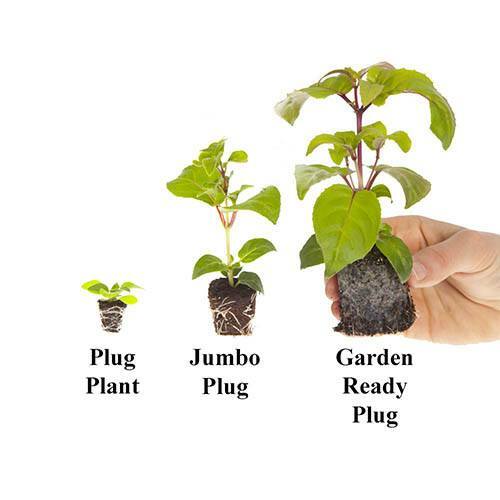 Supplied as 12 plug plants (1.5 - 2cm diameter) ready to plant between April and June for optimum performance. I had to phone Garden Bargains as my plants had not arrived a week after being put in the post. Debbie was extremely helpful and put a replacement order in the post. I have now received my plants in good condition. Plants arrived in great condition as promised . Will continue to use your services again.Many thanks. Delivered on time and in good condition. would have been nice to get an email to let me know that they had been sent,after waiting for them to arrive in stock. Although the plants arrived loose in the box as their containers had burst open, they are surviving. Emailed to state problem and this was replied to fairly quickly. 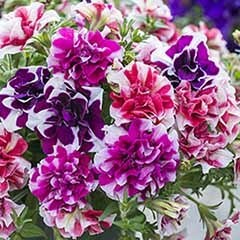 Very good manner on the telephone, plants are very well packed and in good condition when arrived. Very satisfied with your plants. Excellent plants am looking forward to seeing them in flower. Oh no, I am really sorry to hear this. Have you contacted us directly with some images of what you received ? Please do so and we shall action accordingly for you. They seem to have had a tough time in the post. Have potted them on and time will tell, I am not sure yet how many will survive. Arrived on time, packaging too small. The plugs themselves would have been fine but seem to have been put in packaging that was too small consequently one had all its leaves broken off and some others had leaves that were broken. I have planted them all into little pots and they are looking much better but whether the broken one will recover remains to be seen. These have been the worst begonia I have tried to grow, hoping the replacements for the ones that have died already are of a better quality. 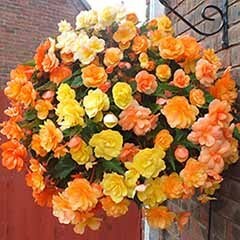 Think I'll stick with my apricot shade begonia. 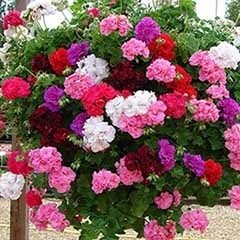 I am so sorry to hear of your disappointment with your Begonias. Are you able to take some images of what you have received please? if so please e-mail them over to us immediately. 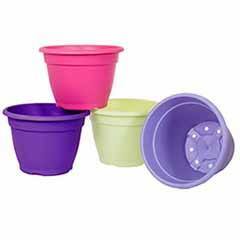 We will of course be happy to replace these for you. 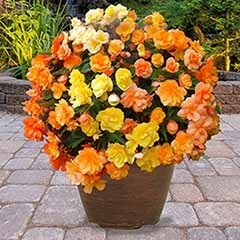 Had 36 scented begonias delivered from this company.when opened containers I discovered 10 of the plants dad broken stems no leaves and some just a ball of soil. I immediately sent them a email to let them know .I received back a automated response email giving me a case number.After a week of no response I emailed them again .As exspected guess what .No Reply .I have now given up on hearing from them.This is obviously one of these company's that take your money and then ignore you when things go wrong.So what can I say except .Buyer Beware .Think twice about .purchasing anything from this company. 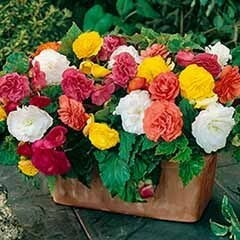 Ordered 36 scented begonias.Of which 10 where badly damaged And the remainder were not up to the standard that I would have expected for the cost of them.I for one shall never use or recommend this company to anyone . Firstly, thank you for your recent order with us. I am ever so sorry to hear that you are not satisfied with the order. Please know that we would be happy to replace any items that arrived damaged as this is not at all what we expect. Please get some images sent over to us. This will allow us to help! We're really sorry to hear that your plants arrived in poor condition after a delay in transit. We'd be happy to refund you. Plants were a bit dried out as they had taken 5 days from their dispatch to the time I received them - more than 30% did not recover - the others were OK eventually! My plants arrived quickly and I was kept well informed regarding the status of my order. 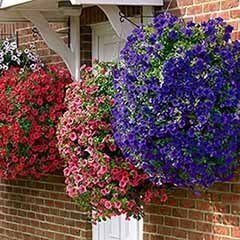 Planted straight into hanging baskets and seen to be doing well. I am sorry to hear that you have been a victim of fraud. However I can tell you that this was categorically not due to our website, which is totally secure. 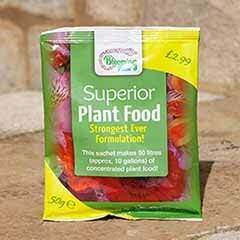 I did have an issue on behalf of my neighbour about the coleus but it was sorted out straight away and my neighbour was very pleased with the outcome and would therefore use you again. Good to hear that we resolved this for you. I was very satisfied with my order. Arrived promptly. Packed very securely and above all plants arrived nursery fresh. Service was good to need to rethink delivery service. Sent at end of week so not delivered over weekend, in fact took 6 days which is too long for such small plants. Well packed but due to length of time in transit they were drying out. As the plants were a week in transit they arrived very dry. They had also been thrown around a bit, so had lost a few leaves. I potted them on immediately, after soaking in water for half an hour and am now awaiting results. There have definitely been some losses were leaves had broken off and the plants were too small to survive, but hopefully there will be a 60% survival rate. very prompt service, but see below . 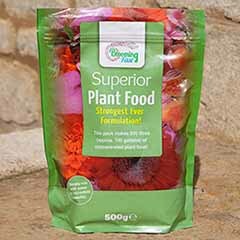 Great products, reasonable prices and fair p&p. 1st 12 plants were fine but 2nd 12 plants were barely germinated. 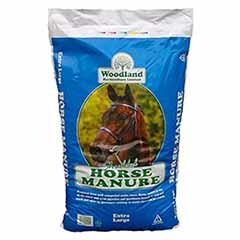 Reported this to customer services and they sent another 12 free of charge. Very disappointing with the condition the begonias arrived 80% of them had to be binned, one very upset customer. I am sorry to hear that your begonias did not arrive in perfect condition. I have arranged to replace them for you. If you'd have let us know, we'd have done this immediately! Delivery driver did not handle very carefully resulting in some plants being displaced from their pods. Only lost 2 when replanted. 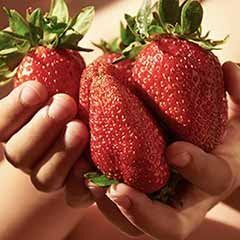 easy ordering on web page. The plants arrived in a terrible condition they had come loose in the plastic case that resulted in compost & plants broken leaves in a heap at the bottom, replacement sent that are not much better, and they are certainly not jumbo plants as advertised, so I will not be ordering again from Garden Bargains. Only 20 out of the 24 were replantable,four of the plants were not none existing. I was very disappointed. Will not use this company again. Good value. Always well packed. They are already planted in pots - this is the first time I have grown Begonias but feel hopeful for a full quota. 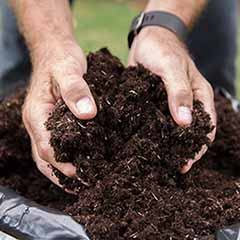 Several plants had lost the surrounding compost. I have planted them in pots, but do not know if they will be OK.